Tesla is leveraging its large fleet of vehicles equipped with sensors in order to gather data for its autonomous driving vehicle program. 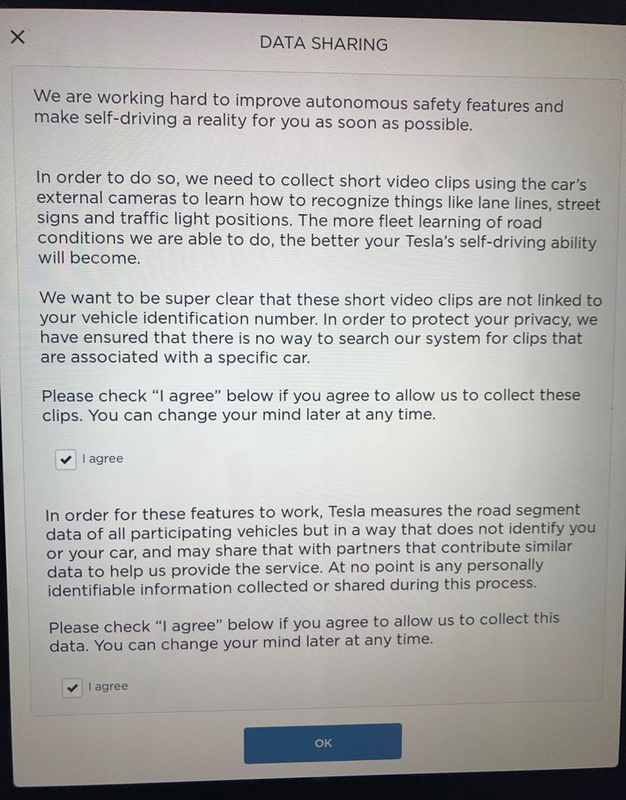 It’s now stepping up its data gathering game with the latest update this week by updating its data sharing policy to include collecting videos in order to ‘make self-driving a reality’. After last night’s update that virtually brought the second generation Autopilot to parity with the features of the first generation Autopilot, Tesla asked owners to approve a new data sharing policy. “We are working hard to improve autonomous safety features and make self-driving a reality for you as soon as possible. In order to do so, we need to collect short video clips using the car’s external cameras to learn how to recognize things like lane lines, street signs, and traffic light positions. The more fleet learning of road conditions we are able to do, the better your Tesla’s self-driving ability will become. The new sensor suite on the second generation Autopilot has 8 cameras, all-around ultrasonic sensors, and a forward-looking radar, which means a lot more of data to gather and certainly when it comes to the cameras. As we reported earlier today, the latest release mostly bridges the gap with the last version of Autopilot and Tesla can now focus on more advanced features – leading eventually to full autonomous driving. The data that Tesla would collect from this new data-sharing agreement will be an important part of bringing the system to the next level.